I finally managed to go birding at Dungeness today following a few aborted attempts at trying to go south! The day began early with a quick visit to Southfleet and it's duck pond for the Falcated Duck of 'probably known origin'! By 0830 we were heading south out of Ashford and towards Snave where a convenient layby allowed us to see 47 Bewick's Swan and two Peregrine sitting hunched down on the fields seemingly trying to avoid the strong winds. 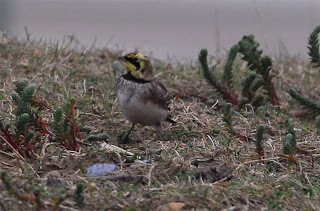 Next stop Rye Harbour in neighbouring East Sussex where the hoped for Shorelark put in an appearance (see photo above) along with a cracking Purple Sandpiper feeding on the seaweed on the groynes. With the brief sortie into Sussex complete it was back to Kent and onto Scotney where constant scanning failed to locate the Long-tailed Duck in the strong wind, in fact Scotney was pretty birdless. Next stop the Long pits and the wintering Red-necked Grebe which despite all our efforts couldn't be found so we sought refuge from the weather on the Dungeness RSPB reserve. 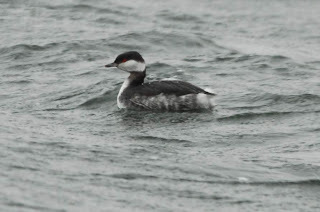 Once settled into the hides we saw two superb Slavonian Grebes, a Shag !! 5 plus Goosander and 18+ Smew. The Red crested Pochards showed briefly then swam off out of view whilst a female Merlin perched on the shingle bank for a while before zipping off. With the no show RN Grebe still playing hard to get we finally located it and saw it feeding in the failing light. Last knockings at the ARC but only a Marsh Harrier and Sparrowhawk of note finishing another excellent day out in Kent. 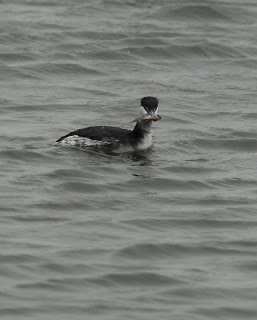 Here's some piccies of the Slav Grebes.